If it’s late September, it must be time for Robin to exit bleary-eyed from the Lightbox theater and stumble into the Cinema Hut to regale us with his findings from the 2013 Toronto International Film Festival. Listen to Ken wish he had more crossover with the upcoming Chicago Film Festival, or follow along at home. Then Ken and Robin Recycle Audio, capping off their suite of excerpts from the Gen Con GUMSHOE panel. Finally, popular demand decrees that we venture into the Eliptony Hut to tackle the recent appearance of a monument to Azathoth in Ken’s old stomping ground, Oklahoma City. 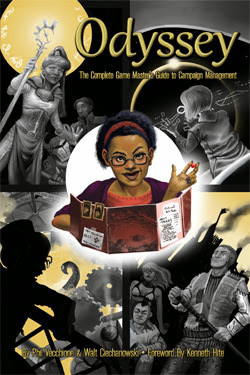 Joining us as sponsor this episode is Engine Publishing and their system-neutral GM resource, Odyssey: The Complete Game Master’s Guide to Campaign Management. Get $5 off in the Engine Publishing store using code KARTAS20, good through November 2013! Also aboard the sponsor train, Eliptonic essayist extraordinaire Matthew Rossi. Check out his Kindle-ready books Things That Never Were, Bottled Demon, and At last, Atlantis at Amazon! This entry was posted on September 27th, 2013 at 9:09 am and is filed under Podcast. You can follow any responses to this entry through the RSS 2.0 feed. You can leave a response, or trackback from your own site. We refresh much more quickly. The players have usually blown through big numbers of points in two or three sessions. In NBA too, we were not shy in our spends. Would you please post a list of the film titles discussed. They went by so quickly it was difficult to follow the discussion. Yes, what Jeb said! I listen in the car on my way to and from work, and it’s hard to write down the titles when dodging traffic. Also, sometimes you forget to say the titles. Until such time as Jeromy can get to it, Robin listed the whole slate of films he saw at TIFF on his website. Sorry for the delay, but here is a fairly comprehensive list of all the movies discussed and a few books. There are a couple of references even I missed with my endless pausing and rewinding as I’m looking at my notes and not finding anything on google searches.